12-Month Worry-Free Warranty, 60-Day No Reason Refund and Free Lifetime Technical Support. Any problem, please feel free to contact us through Amazon message system and we will do our best to serve you. Made of premium 1860D nylon+EVA+Velvet, the soft plush cloth inner provides extra protection to your Oculus Go and accessories, shock proof, scratches proof and Water-resistant. It's portable and fashionable, Size: 20*16*14cm, Weight: 350g, designed with comfortable hand strap, easy to carry your Oculus Go outdoors. Designed with extra mesh pocket and slot for remote control, charger & other accessories storage. 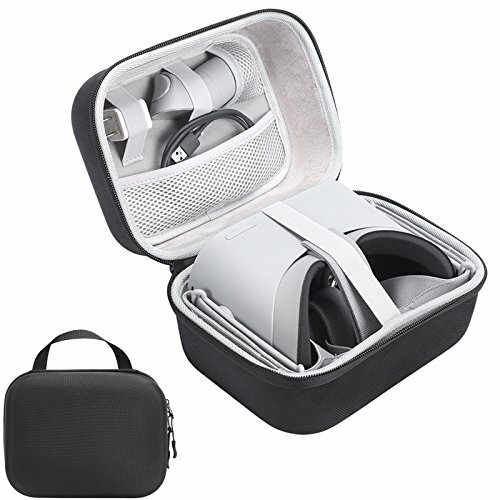 Convenient to carry Oculus Go Virtual Reality Headset and accessories, and protect them perfectly against shock and pressure. Classical double zipper is durable and convenient to open and close, easy to storage and take out your Oculus Go VR Headset and accessories. Enjoy the Virtual Reality world anywhere and anytime. If you have any questions about this product by XBERSTAR, contact us by completing and submitting the form below. If you are looking for a specif part number, please include it with your message.